This Kat Von D Lock It Foundation is something else that I picked up when I placed my first Sephora haul a couple of months back. I hadn’t really been looking to buy this foundation, but I thought that I would try it out seen as though I was going to buy the Kat Von D Lock It Concealer. I don’t know what it is, but I always love to try the matching foundation a concealer because then I think that you get a really clear picture about how a product works, because a product should always perform the best with a corresponding product from the same brand. Firstly, I really have to say that I love the packaging of this foundation. The bottle itself looks like it has been tattoos, which is just perfect for a Kat Von D foundation. I myself love tattoos, I wouldn’t have any more myself and to be honest the one which I have on my wrist I don’t like anymore but I love tattoos on other people… when done tastefully. I like the fact that this foundation comes with a stopper on the end. Because it doesn’t come with a lid on it can be quite easy to press the pump without meaning to. But it comes with a small black stopper so you don’t make a mess all over your shizzle. The product itself, I will admit that I was a little dubious about it to start with. Especially when I saw how deep the colour was in comparison to the Koh Gen Do foundation that I also bought in the same Sephora haul. But it turns out that this foundation is more suited to my skin tone than the other one. I got a yellow base foundation because it works best for me, my olive complexion and my self-tanner. There seems to be a very generous shade range for this foundation and there should be something in the range to suit almost everybody from very fair people to even the deepest of skin tones. I would say that this Kat Von D Lock It Tattoo Foundation feels almost more like a mousse than it does a liquid. I pumped out one squirt of this foundation out onto my pallet and it was so incredibly thick. It spiralled up and held its shape which just shows how thick it is. But when I applied it to my face it didn’t feel like it was a thick and cakey foundation. I would say that the consistency is thicker than the MAC Studio Fix Fluid but to me personally, this feels much nicer on the skin. I would say that it applies similar to the Maybelline Dream Matte Mousse which is a blast from the past, but I am sure that most people will get the reference. Now for one of the main reasons why I bought this foundation and that is the level of coverage that this product gives you. This is a very high coverage, I would go as far as saying that it is quite intense, which is exactly what I like. I am sure I have said it before here on my blog, but I have a lot of darkness underneath my eyes and areas of hyperpigmentation, which I like to try and hide with foundation and this one does it perfectly. Just one light layer of this and everything really is completely hidden, and I don’t have to worry about going in with concealer in that area or a high coverage powder, because the foundation has already done all of the work. I take this foundation and blend it onto the skin using my trusty old favourite, the Morphe M439. This brush is so densely packed, so it really buffs the foundation into the skin and it really does do all the work for you. I think that this brush is well suited to a foundation like this because it works it in and makes it feel nice and natural on the skin, which helps to combat the thickness and heavy feeling that I am sure you could get from a foundation like this. Plus, the Morphe M439 is incredibly cheap, which is another reason why I love it and reach for it all the time. Overall, I would say that this Kat Von D Lock It Tattoo Foundation is a matte finish, which is exactly what I am after because I am combination, but I am ever so slightly more oily than dry. Even though this is a matte foundation, I don’t find that this is drying in anyway and even the areas around my forehead where I can be pretty dry, I feel like the foundation sits really nicely. 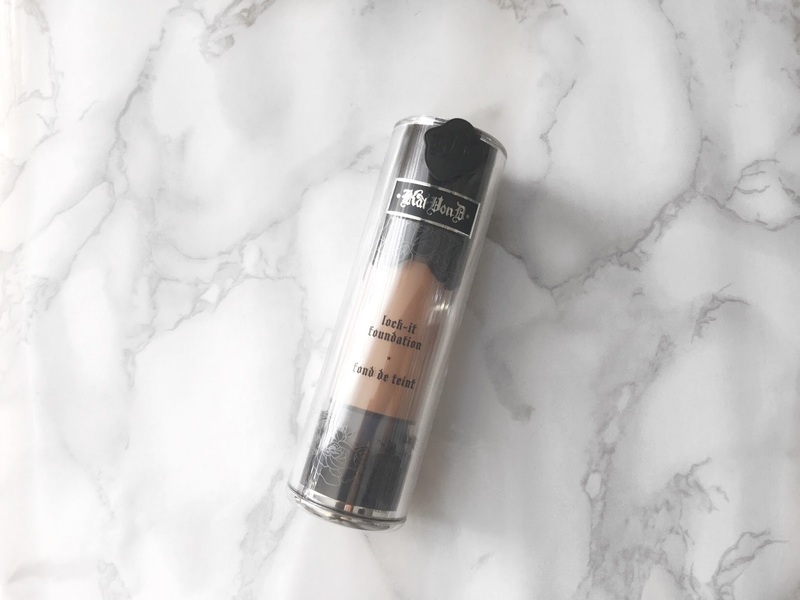 This foundation has really good staying power and it stays in place all day long and I never have to worry about how it looks on the skin, or about transferring or becoming patchy throughout the day. Something else that I just want to quickly mention about this product and about the Kat Von D brand as a whole is that it is now stocked at Debenhams here in the UK, so you can order online or go into store. If they had only started selling it a couple months sooner, I could have ordered from them and been a couple of pounds better off. Plus, the whole line of makeup is vegan, which is incredible! There really isn’t much more that I can say about this foundation that I haven’t already said. I think that it is a lovely product that gives me a full coverage look that I am after. This hits all of the nails on the head for me and if I was to have one criticism it would be that it can be quite heavy on the skin, but nothing that buffing and using a light hand cannot fix. I will leave a link to this product down below in case you want to check it out for yourself or learn a little more about it. Make sure to leave me a comment and let me know if you have tried this foundation out for yourself and tell me what you thought about it! this sounds really nice, I love a full coverage foundation but I'm not always a fan of a thick texture so I may have to try a sample! I would definitely suggest trying a sample out! I love the look and sound of this! Definitely on my wishlist now! Will have to look at some swatches online I think though, I wouldn't know where to start with shade matching without seeing it in store and I think it's only going to be in Debenhams in London to start with!